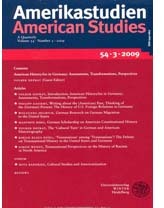 Since October 2011, the quarterly journal of the German Society for American Studies (DGfA) has been published by the American Studies Department of Mainz University, with Prof. Dr. Oliver Scheiding as General Editor. The quarterly journal publishes articles covering the entirety of the interdisciplinary approaches to American Studies in German: literary and cultural criticism, essays on history, political science, media studies, linguistics, and the teaching of American Studies. The journal alternates single-essay issues with thematic issues permitting guest editors to cover broader surveys of subfields of American Studies. A review section, frequently featuring discussions of German contributions to the field, complements the scholarly essays. The journal is currently published by Universitätsverlag Winter, Heidelberg. Further information on how to contribute to the journal can be found at the journal homepage, a link to which is included at the right.